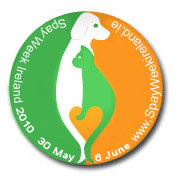 Well, its that time of year again when all of us concerned with animal welfare in Ireland on a daily basis try to highlight the crises we have with abandoned and unwanted dogs and cats and the important role spaying and neutering has to play in reducing this problem and improving the lives of all Irish animals. Current conservative estimates put our daily dog destruction rate at 18 and while that is a definite improvement on previous years, we still have a long way to go. The situation for cats is most likely a lot worse though it seems no official figures exist, anecdotal evidence clearly suggests that a cat’s life in Ireland is very cheap. Already over on the Spay Week Ireland Facebook page, criticisms have been raised about the suitability of publicity photos depicting apparently healthy, well fed, cute pups with celebs – “I want a puppy!”. The reasoning behind these shots from the organisers that these are the only kind of photos the media are likely to use is flimsy at best, patronises the media, and becomes even less credible when these same photos are given prominence on the organisation’s own website where they do have full control. Truly a missed communication opportunity. But for me, the real disappointment here is that, despite the involvement of generous vets nationwide, there is no national voucher scheme in place. Those who may be convinced by the coverage that neutering and spaying is the right way to go but who may not have the financial resources to cover the standard rates will be left to source subsidised services themselves with no points of contact for same on the Spay Ireland website or Facebook page. I am sure highlighting shortcomings of this initiative will raise the ire of quite a few of those involved but that is not my intention. I do not doubt that everyone’s heart is in the right place on this issue and do not question motives in any way. My point is that it is difficult enough to sell the idea of spaying and neutering in Ireland at any time for cultural reasons, but particularly in these harsh economic times, anything we can do to make the right choice easier for people to make, should be done. This entry was posted on Thursday, May 27th, 2010 at 1:13 pm	and is filed under Uncategorized. You can follow any responses to this entry through the RSS 2.0 feed. You can leave a response, or trackback from your own site.